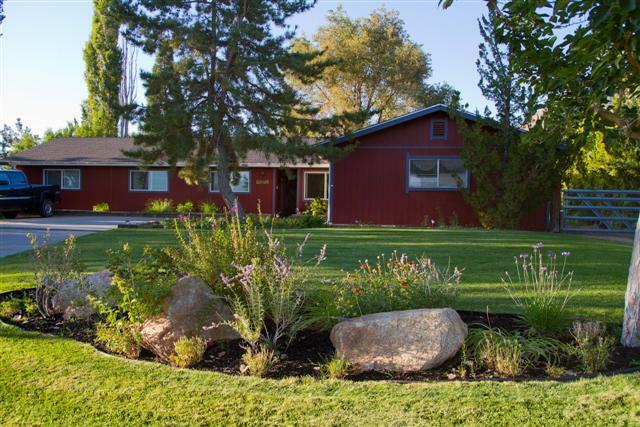 This beautiful home 3 miles S of downtown Bishop is ready and waiting. With 5 bedrooms and 3 bathrooms there is room for everyone. The kitchen has been newly remodeled with Hickory cabinets and granite counter tops. Updated bathrooms. Wood laminate floors in the living room, dining room give this home a warm, rustic feel. With an open floor plan this home is great for entertaining and enjoying family. The living room is warmed by a propane fireplace and there is a updated F/A heating unit. Dual pane windows and rain gutters. Outside you will be amazed at the spacious lot that is landscaped with flower beds, pavers, garden retreats, fruit trees and covered patio. RV parking. Zoned for equestrian use, property has barn and riding arena. There is so much to offer you must see this home to appreciate it. Sales terms are subject to the seller's lender approval.